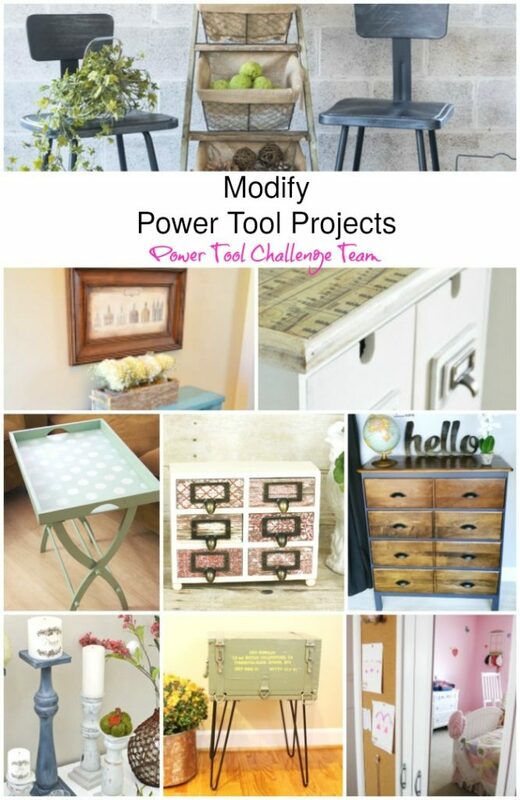 The theme for this month’s Power Tool Challenge is MODIFY. 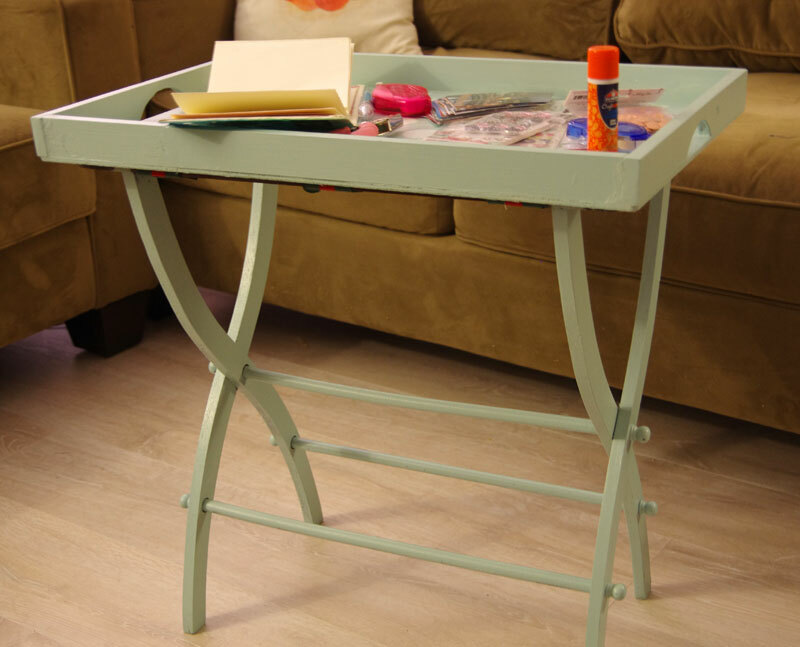 I modified an old, dusty wooden luggage rack into a really cute and useful portable craft table. 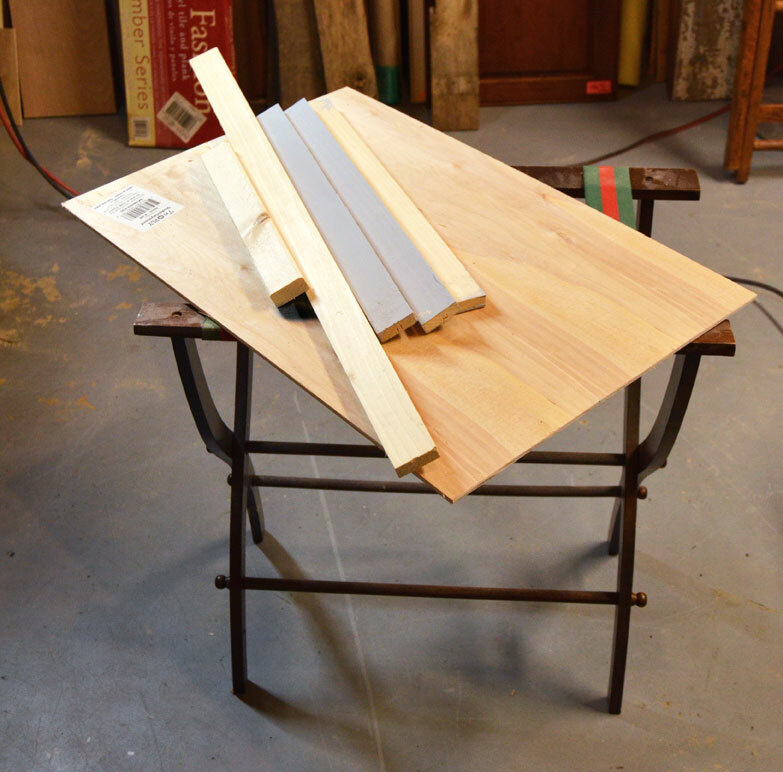 I also used scrap wood: 1 x 2s for the frame and thin plywood for the base of the tray (table top). 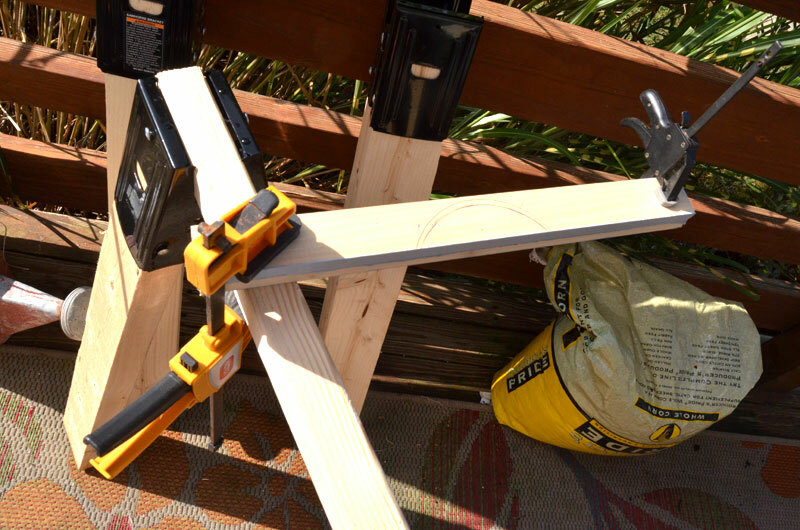 I clamped the two end pieces together before cutting out the semi circle with the jigsaw to be sure both handle pieces were the same. 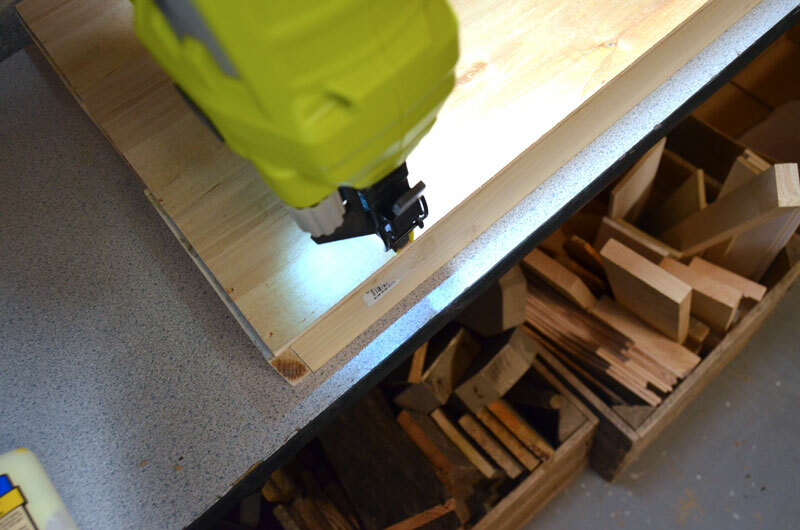 The process for making the table top is pretty straight forward. Just make a frame with the 1 x 2 to fit the size of the plywood base. Attach with wood glue and brad nails. Now for the fun part! Finishing! 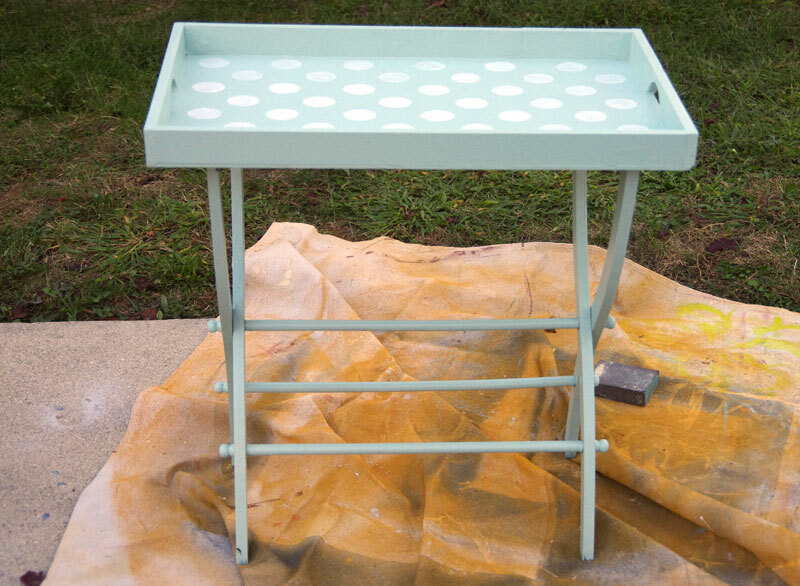 I first painted the table and suitcase rack (base) with DecoArt Americana Decor Outdoor Living Paint in a color called Frosted Glass. Isn’t that a pretty color! 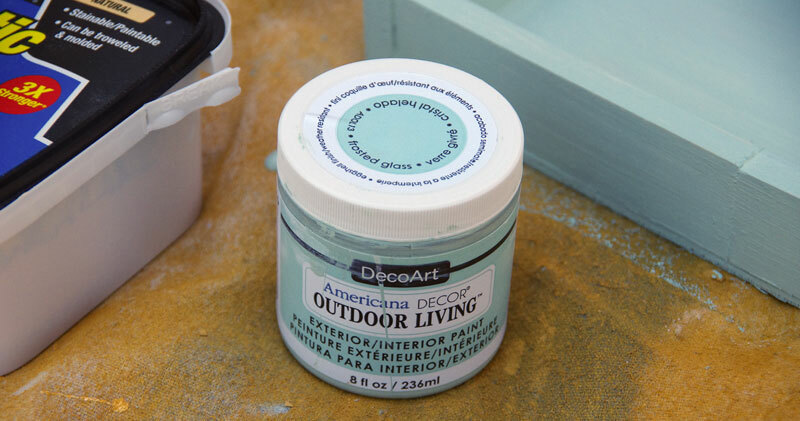 Then to make it even prettier I used one of DecoArt Americana Decor Stencils and DecoArt Americana Decor Color Stain in white. Once the paint was dry, I attached strips of self-adhesive hook and loop to the base and also to the underside of the table. Now I can easily attach and detach the table! I’m pretty proud of this portable craft table. It is going to get a lot of use. In fact I used it the same day that I made it! I carried the top part up to the my craft room and loaded it up with some scrapbooking supplies. Then I got comfy on the sofa, scrapping and watching TV last night! It’s so easy to put together and take apart. I love it! Now let’s go see why my friends have MODIFIED! 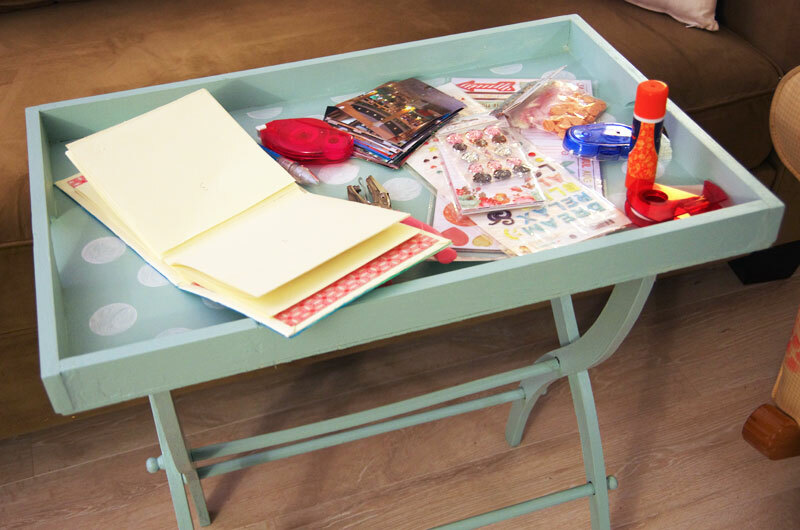 Great idea Jeanie to make the portable craft table. I craft (work on projects) whenever, wherever I am) I’m curious to see what you have up your sleeve for that cabinet door. Brilliant idea and I love the color! This is such a great idea! I could have used this week! 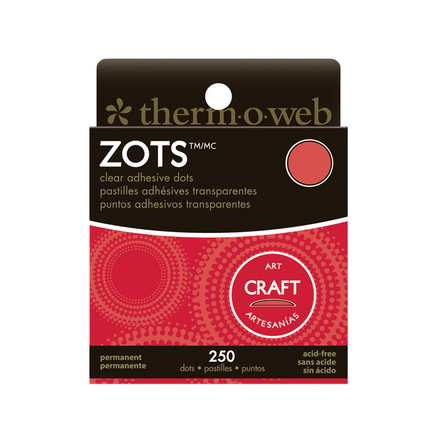 This is perfect for working on crafts and you can use it for entertaining as well. 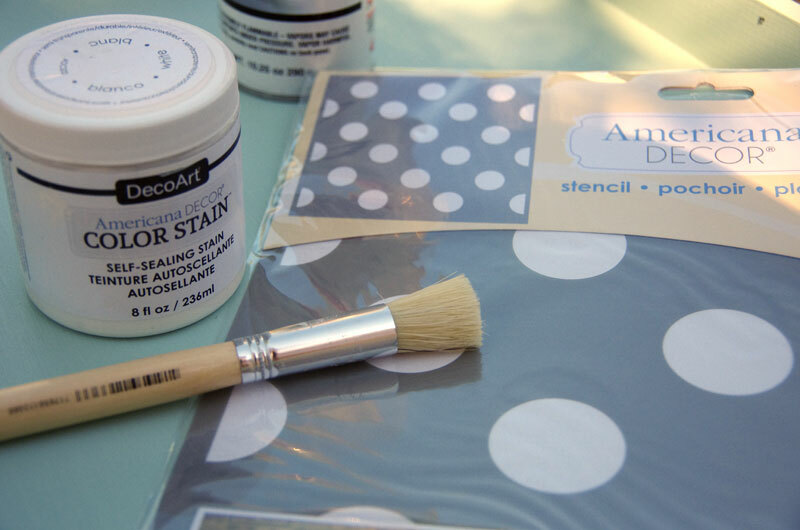 Love the polka dots and pretty color that you used. 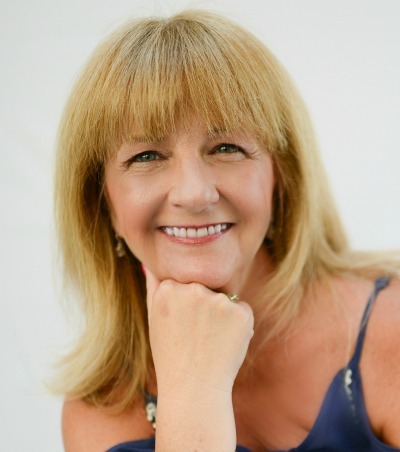 This is such a great project Jeanie! Definitely worth the eye roll :-). I love that color too, so pretty. 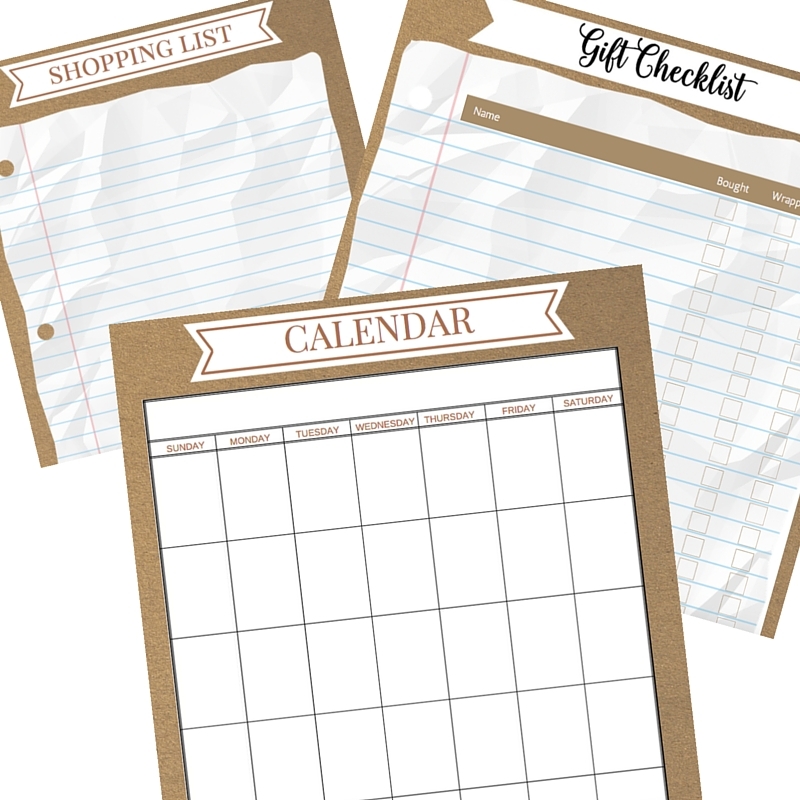 i love the crafts, ideas and design you do here… i got your blog off the mostlyblogging linky 🙂 blessings your blog is great and hope to see u again there and here. maybe you would like to visit my blog. i hope to get into crafting I have some ergonomic issues and such … but maybe i can do something 🙂 but i love looking, learning it is all great. Blessings! What a great re-purpose and I love the color you chose! It turned out so nice! 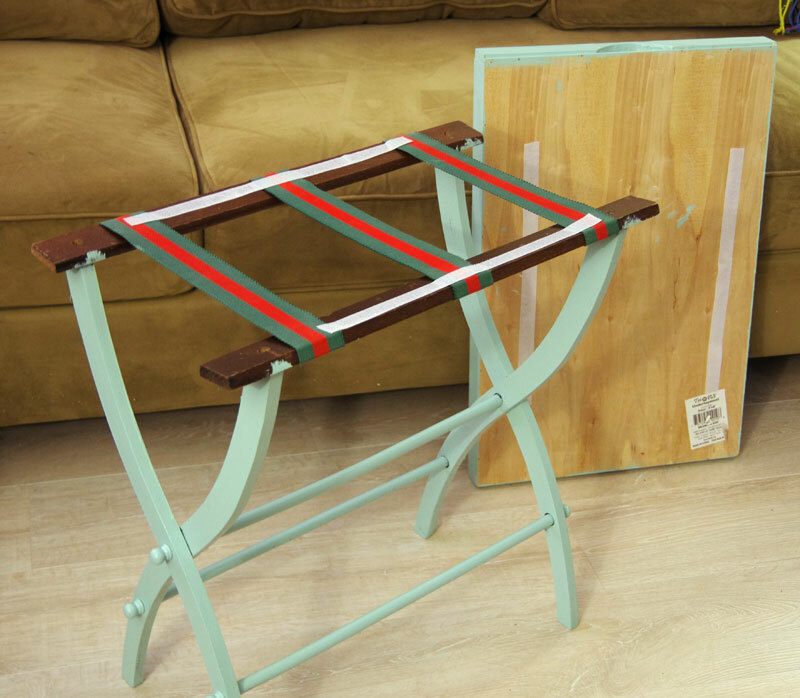 I love that it is made on a folding luggage rack and can be stored away if you’re not using it! So creative! I can see this being used for breakfast in bed, give that hint to the hubby! This is cool! I need one of these travel craft trays so I can craft wherever. This is a great transformation, especially with the polka dot top. 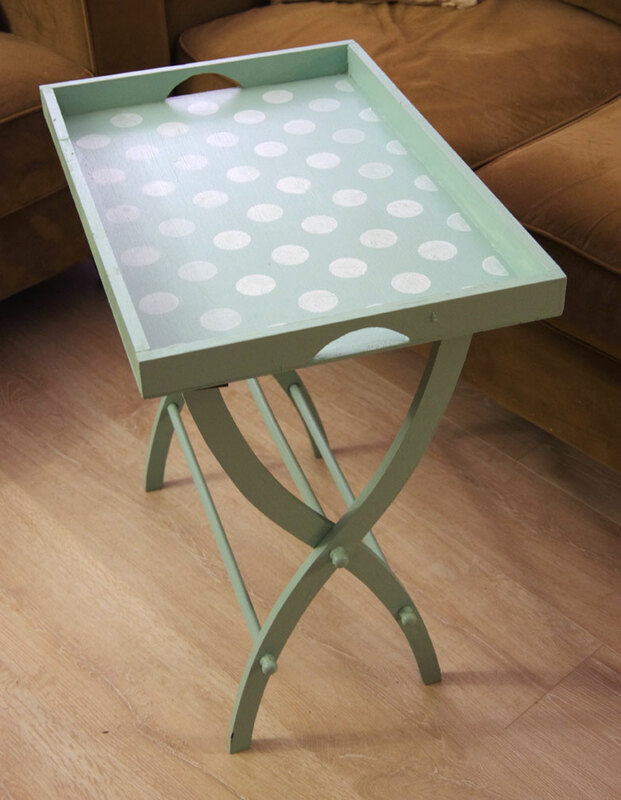 I love this portable table. 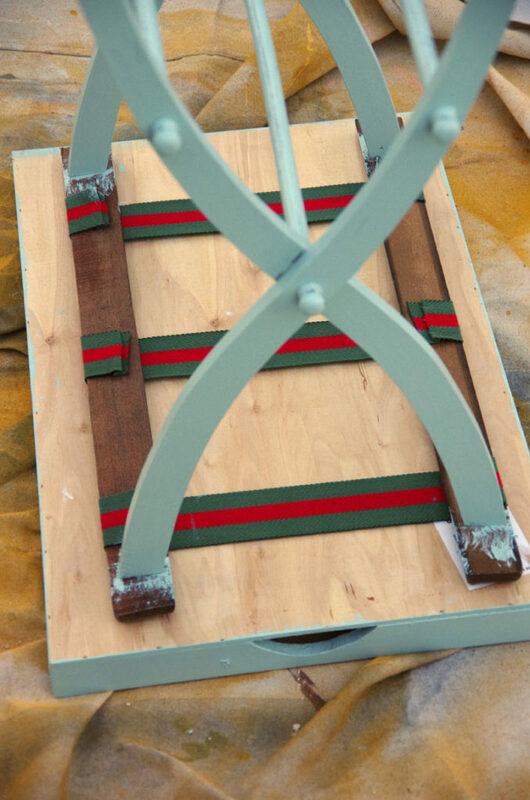 I have one of those old luggage racks just waiting for a makeover. I also love the colors you used. Great job! That is such a beautiful color! I wonder if I could use it on my front door since it says it’s for outdoors? You did a great job! How handy! I took the easy route and bought a Raskog cart from Ikea and use it as my mobile craft room, lol! thanks Candy! Yes, I don’t see why you couldn’t use it on your front door. I have one of those Raskog carts too – isn’t it great to store craft items that you use frequently! Great crafty ideas! Cutest little tables I have ever seen!